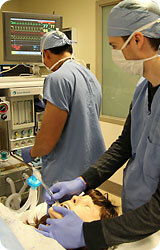 The Basic Two-Week Clerkship is an introduction to the specialty of anesthesiology. The Two-Week Clerkship provides an overview of anesthetic techniques used to obtain pain relief during surgery and to facilitate performance of surgical operations. Students will also learn certain essential psychomotor skills that all physicians may be called upon to perform under controlled and emergent situations. The Advanced Four-Week Clerkship provides a more in-depth and comprehensive view of the role of physician-anesthesiologist in the preoperative evaluation and preparation of critically ill surgical patients, and in the intraoperative and postoperative management of patients undergoing major surgery. 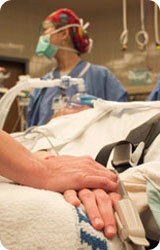 The clerkship will be of interest to students considering Anesthesiology as a career. The department conducts a regular series of clinical conferences, didactic lectures, and research seminars. 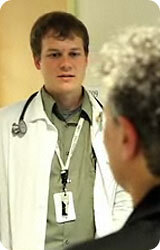 Opportunities for collaborative research are available to undergraduate and graduate students. We offer multiple clerkships across the WWAMI region, for more specific information please check the Clerkship Catalog. Have concerns about the learning environment? Report mistreatment or serious concerns. Tel: 206-543-1032 | Fax 206-543-2958 | anesstu@uw.edu.